We are very excited to announce that Stageworks Academy of the Performing Arts Dance Team have the once in a life time opportunity to travel to Disney World and dance down the parade with all of your favorite Disney characters. They will be in the Magical Kingdom from June 29th to July 3rd. For the past ten months, these students have been rehearsing for this amazing opportunity. They have learned the choreography for the parade, sent to them by Dance the World Disney instructors. Stageworks dancers have also put together a Michael Jackson Tribute dance routine which involves different dance styles such as jazz, ballet, hip hop, lyrical and contemporary. Stageworks put together a Disney Princess themed float for our local parade on June 1st to advertise 'Dance the World' which also involved the dancers performing the parade routine down the streets of Leduc. While families have worked tirelessly raising funds through selling pizza and other products, zumbathon and bingo's. Arts director, Darla Lemay, states "Dance the World Disney experience will be a great opportunity for dancers to recognize that dance is a legitimate career." Students will be dancing in the parade in Downtown U.S.A, Disney World Florida, which just so happens to be on Canada Day, July 1st wearing their Canadian colors. 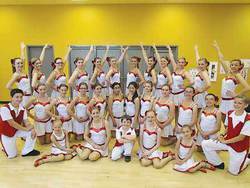 On July 2nd they will be performing at Hollywood Studios, with a dance routine prepared by instructors at Stageworks Academy. They also have the great opportunity to participate in a workshop designed to show them and put them through all the stages of a real dance audition. It is safe to say that this is a once in a life time opportunity for these dancers.